Bring a large pot of water to boil. Add potatoes and cook for around 10 minutes until firm but cooked through when skewered. Drain well. 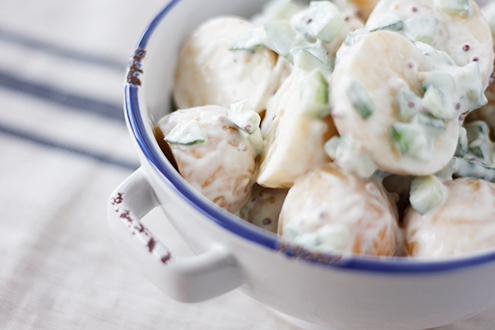 When slightly cooled, gently toss potatoes and cucumber with yoghurt and mustard. Season to taste. Additional ingredients: Dill and/or finely chopped pickles/ gherkins would work well. Post-GDM suggestion: Some small crunchy pieces of pan-fried bacon would add smokiness to this simple salad.